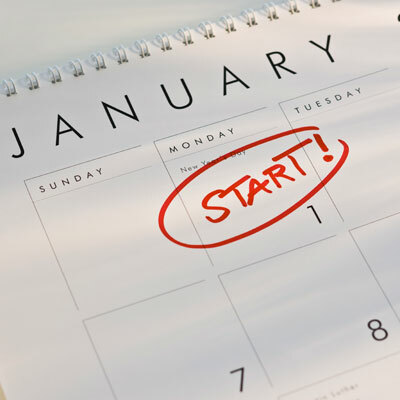 New Year’s Resolutions typically focus on self-improvement: a new diet, more exercise, waking up earlier etc. Although we all work incredibly hard to adhere to the gluten free diet, there is always room for improvement! Making a New Year’s Resolution focusing on improving your gluten free diet is a great way to improve your health and happiness in 2012. I hate when I get “glutened.” I find it so discouraging and depressing, not to mention the fact that I am in physical pain as well. There are steps we can take, rules we can follow, that will decrease the likelihood of getting sick at a restaurant. The steps aren’t fun…that is why I advise that you take this GF challenge as your New Year’s Resolution. #1 New Year’s Resolution: Be Gluten Free. What am I talking about? I’m already gluten free!! What I mean is, be extremely gluten free. I sometimes find myself experiencing this at restaurants: I am fairly confident that a dish on the menu is gluten free but I just want to double-check, only to discover that my waiter has NO idea what I am talking about and can’t answer a single question. Despite my diminished confidence in the dish, I order it anyways. I sometimes find myself experiencing this at friends houses: someone offers me something to eat that they have made but they have no idea what gluten is and stare at me with their eyes glazed over as I try to ask what ingredients they used, but I eat it anyways. Many times, I feel so frustrated when I am almost certain, but want confirmation that something is GF that I just give up trying to communicate and just eat whatever the food in question is. My New Year’s Resolution is to stop doing this. At restaurants, order things that are naturally gluten free (still double-check for cross-contamination though). Instead of asking questions about a chicken dish that may or may not be dredged in flour, order a salad without croutons or dressing. Instead of ordering a soup that may or may not be thickened with flour order a hamburger patty without the bun. DO NOT order french fries at restaurants. They can be coated with a beer batter, coated in a wheat paste and/or fried in contaminated oil, all scenarios that a waiter is unlikely to know about. Don’t try to “beat the system,” instead, proudly embrace being gluten free. Being truly gluten free means giving up uncertainty. If you are unsure, do not eat it. I find that erring on the side of caution is better for my health but is difficult to do because of social pressure to be less “picky” about food. My New Year’s Resolution is to be truly gluten free by giving up uncertainty and erring on the side of caution. My second New Year’s Res is to become more informed by following some gluten free blogs and twitter accounts. This may sound funny, as I am a blogger but I am not very involved in the gluten free blogging world as a reader! My goal is to find some GF blogs that I find helpful/interesting and that are updated regularly and follow them. Of course, you can always start off the New Year by following my blog, CC Gluten Freed. In the future I will post some of the GF blogs that I have started following as part of my New Year’s Resolution. 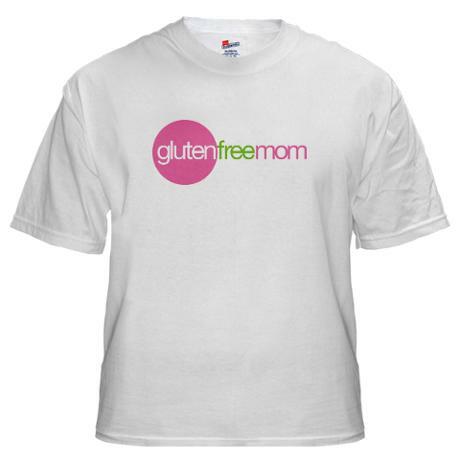 You can search #glutenfree or #celiac to see relevant tweets about being gluten free. My third GF New Year’s Resolution only applies to people with “smart phones” and it is to start using the phone to help with the gluten free diet. How? Download apps like “Find Me Gluten Free,” an app that takes your current location and gives you a list of GF restaurants near you. The app provides info about the restaurants, their GF menu, phone number, address and directions. Other useful phones apps are “scanner apps,” like Celiaccess, that allow you to scan the bar code of a product at a grocery store and the app will tell you if it is GF. This means you no longer have to strain your eyes reading the teeny tiny text of the ingredients. I also suggest downloading a News Widget set to update you on any news about gluten. Set gluten as the key word and everyday you will have new articles about gluten from all over the world right on your phone. I hope the New Year is filled with health and gluten free food! Good luck with whatever you decide to do for your New Year’s Resolution! If you have anymore GF Resolution ideas post a comment. When you are diagnosed with Celiacs you say goodbye to many things. You must say goodbye to bread, to pasta and to easy, stress-free dining. On the other hand you also say goodbye to poor health, to weakness and to pain. Is family tradition amongst this list? How hard should you work to sustain tradition despite the gluten-free diet or should you simply let go of old traditions and make new ones? The issue of traditions conflicting with the gluten-free diet seems most pertinent during the Holidays. What does your family do for Christmas dinner and does it support your gluten-free diet? Here is my story. 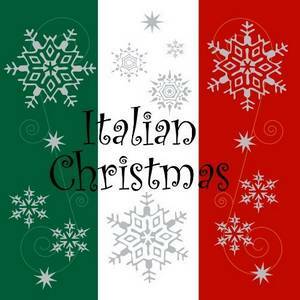 I come from an incredibly family oriented Italian background. At some point during every Holiday season the family gets together and spends hours in the kitchen making ravioli for our Christmas dinner. The recipe and process are part of a very old family tradition that brings Bonaduces from across the country together. When I was diagnosed with Celiac Disease, the summer of 2008, we were so busy trying to figure out how to be gluten-free on a daily basis that we didn’t think much about my gluten-free future. My first Celiac Christmas there wasn’t much for me to eat, it was as if our family ravioli recipe should somehow be exempt from my GF diet and we didn’t plan ahead. In the following years we tried many alternatives that would accommodate me while still preserving the family tradition: a side of GF gnocchi (failed), separate GF ravioli (failed) etc.. Eventually we found that the easiest solution, one that tasted good and completely avoided cross contamination, was to make GF lasagna a day before we made the ravioli. Although this solution is fairly satisfactory there are still some issues at hand. 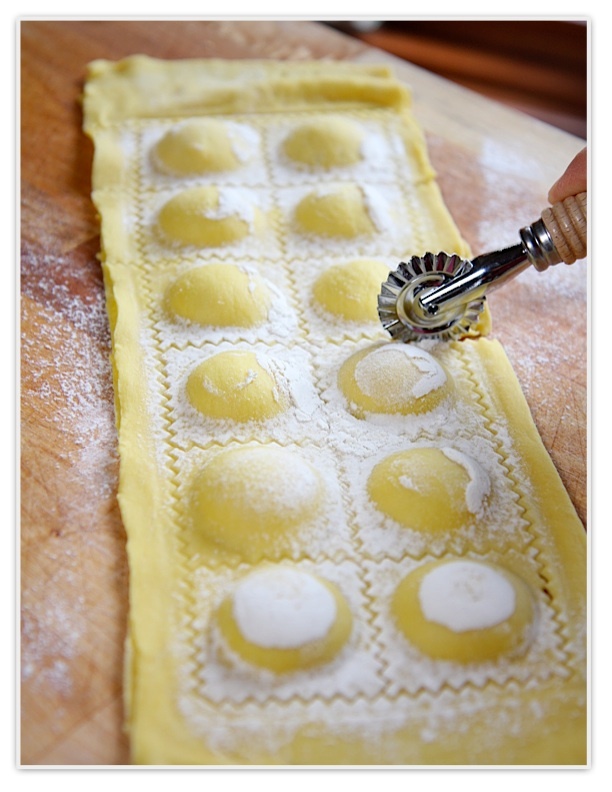 For one, we make the ravioli at my parent’s house which is where I stay during the Holidays. This means that the house is filled with flour, the kitchen is completely dredged in flour and must be cleaned thoroughly to the extreme and the air is a potential contamination risk for days. Secondly, I am excluded from the family gathering. I can’t be around people cooking with flour, check out this post for more information about the dangers of air-bourne gluten! The family gets together and bonds over the process and reminisce about family stories while I have to go keep myself busy outside. Should gluten-free people impose their lifestyle on the family to the point of altering time-honored tradition? In a way, it makes very little sense for a Celiac to continue a gluten-based tradition because Celiacs is genetic! The family is biologically unfit to have such traditions! Where do you draw the line between science and sentiment? I don’t know the answer to this problem. The best way to sort through the issue of tradition and Celiac Disease is to speak openly and honestly with your family. I know that my family would be terribly sad if we stopped with the ravioli tradition, I understand that and so for now I am happy to make GF lasagna on a separate day, in a separate kitchen to protect both myself and the family tradition. Despite my spoken pragmatism, I do hope that one day we can change the family tradition to something that I can take part in. 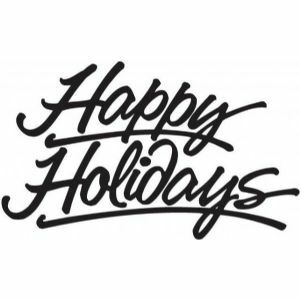 As always, I hope everyone has an enjoyable and relaxing Holiday season! The key to holidays and being gluten-free is staying calm and communicating your needs to your family. 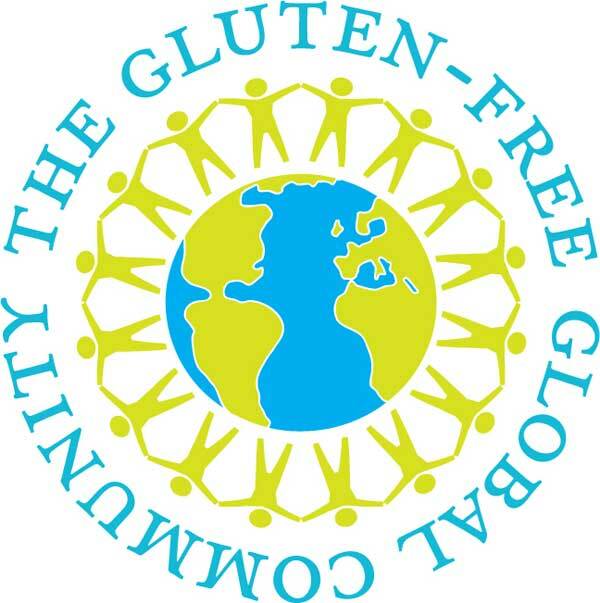 There is no clear nor easy answer when it comes to deciding what to do about gluteny traditions when a family member is diagnosed with Celiacs or gluten intolerance. Try not to get upset about the things you miss and, instead, get excited for the new things you can bring to the Holiday season like delicious GF lasagna, GF gingerbread etc etc! Take pride in your ability to make the holiday gluten-free and show off your culinary work to the extended family during the holidays! They will both be impressed by your work and will slowly come to better understand your needs as a Celiac. The GF blogosphere is well stocked with gift ideas! Most of what I have read advises that people put together gluten free food gift baskets for their GF friends and family, either by baking GF goodies, buying GF goodies or finding premade GF gift baskets online. While this will show that you went out of your way to get a gift and demonstrate that you understand your Celiac friend’s needs, I advise against this approach. Why? 1. It’s a stressful gift – I am so touched when my friends bake gluten free for me but I also have a residual and unrelenting fear that they may have chosen incorrect ingredients or cross-contaminated while using their kitchen. I don’t want to ask a million questions about how and where they baked the goodie, I mean, it is a gift after all! If the gift is a bought/packaged food product, I can always read the label but I still feel nervous about trying new products. 2. Uncertainty of quality – When you buy premade food gift baskets, there is a chance that not all of this company’s products are very good. Why take the risk? 3. Creatures of habit – most Celiacs I know, myself included, are creatures of habit. We know what we like and what is safe and like to just stick to those products. I am always willing to try new things but I like to do so at my own pace and only after I have the chance to do some research on whatever the new food or product is. Of course, these 3 factors probably do not apply to everyone so if your heart is set on baking or buying GF goods don’t scratch it off your list per se! These are just some things I think you should consider before buying a gift for a GF buddy. Here are my 2011 Holiday GF Gift Suggestions for various types of GF people (coworkers, family members, friends, parents etc)! Click here to see where you can order this magnet. Triumph dining cards make dining gluten free much simpler. These cards explain the dietary needs of a Celiac in multiple languages so that you can safely eat any type of cuisine. These cards are equally useful for new and seasoned Celiacs. Click here for ordering information for triumph dining cards. Toaster bags are a must for Celiacs sharing a kitchen with non-gluten free people. These sleeves protect GF bread from cross-contamination in the toaster. Personally, my toaster is designated gluten free but not everyone has this luxury. 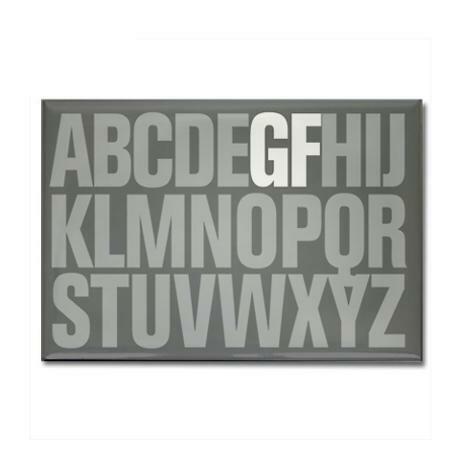 This is a great small gift for someone heading off to college, living with roommates for the first time. Click here for ordering information for toaster bags. For any GF person: Great coffee mug, one of cafepress.com’s many great GF logo creations. 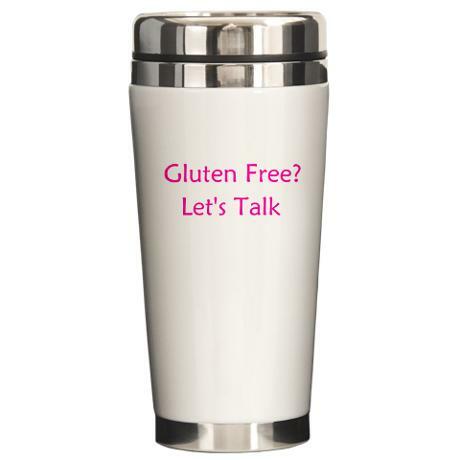 Check out their website for ordering information and browse around for other GF coffee mug designs. 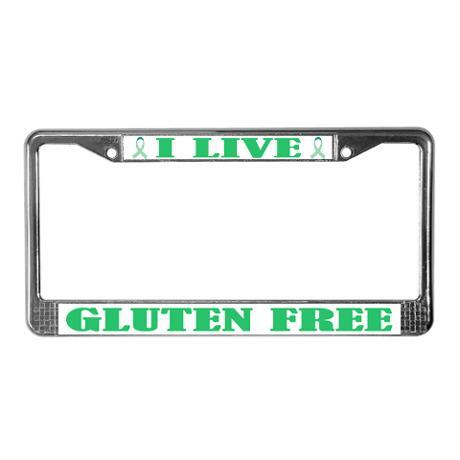 This license plate frame is a great gift for a gluten free friend! It is something that your GF friends probably haven’t come across before and is a great way to spread awareness. Click here for ordering information. 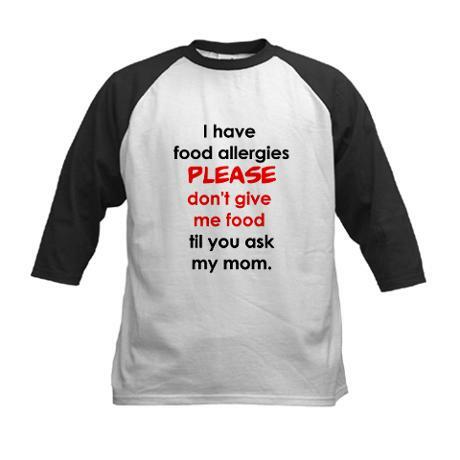 For your friend with the GF kid: this shirt is very cute and practical. Make sure your friend’s kid is young enough that they won’t be embarrassed by this shirt! I bet this will save a lot of moms and dads from worrying when their super young Celiac heads out for their first sleepover. Gluten Free Parents: Although my dad does not have Celiacs, he adheres to a strict gluten free diet just to be supportive. If you have a parent like this I am sure they would be touched by this gift (I know my dad was)! Click here to order for a GF Mom. 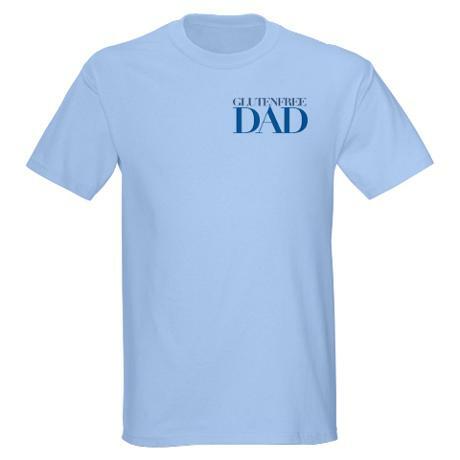 Click here to order for a GF Dad. For your friend who loves to bake: These are cupcake holders that say “gluten free” on them. This is a great gift for anyone who loves to bake. For example, one of my best friends is not Celiac but loves to bake gluten free (for me!) and I know this gift would not only be fun and cute but downright practical. I know that whenever I bake and bring cupcakes to a party I always put a sign out so that people know they are GF, with these cupcake holders I won’t need to do that anymore. Have a great and gluten free Holiday season!